Home > Paint Workshops > Workshop 3: Not Just Furniture! 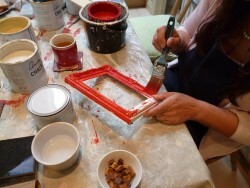 Shabby Chic Paint Workshop 3 - Not Just Furniture! Having learnt the main techniques, this is where you put them into practice! Make signs to hang on the wall using stencils or decoupage or both. Paint wine bottles to stand on display, add decoupage labels, crackle glaze and dark wax to age them. Paint and stencil some flower pots for herbs. Maybe paint a picture frame or mirror frame, and age it with crackle glaze and dark wax? A huge range of ideas! We bring wine bottles, plant pots, wood of various sizes for the signs and of course, the paint, brushes, waxes, stencils and a huge range of decoupage images. We also demonstrate a few other ideas to show you just how easy it is to make something really cool! Please note you should have completed our Paint Workshop 1 and Paint Workshop 2 or similar before taking this workshop.